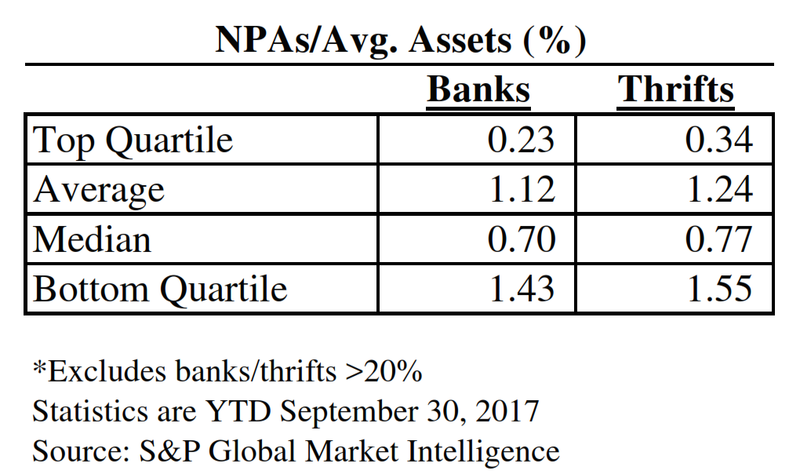 Jeff For Banks: For Banks, What Is Top Quartile Performance? What is top quartile financial performance? I am often asked this question, and top quartile performance appears as stretch goals in many strategic plans. And I say bravo! Nobody wants to be average. 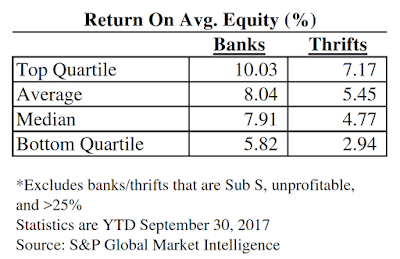 Usually top quartile performance is compared to a bank's or thrift's pre-selected peer group. Executive compensation is often tied to it. I won't belabor the point. A key benefit of being a blogger is that I can use research I perform for my own knowledge to benefit my readers. The below statistics are from all FDIC insured financial institutions either for the year-to-date ended or period ended September 30, 2017. 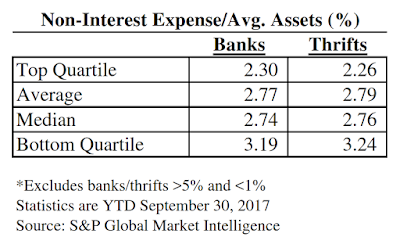 This period end was largely driven by the significant number of financial institutions taking deferred tax asset write downs in the fourth quarter, which would have skewed ROAA/ROAE for the year ended 2017. I used Call Report data, so the calendar year is the fiscal year. I also excluded extraneous performers by category, as noted in the footnotes of each table. For profitability numbers (ROAA, ROAE), I excluded Subchapter S financial institutions. Quite a large cohort at over 1,900. 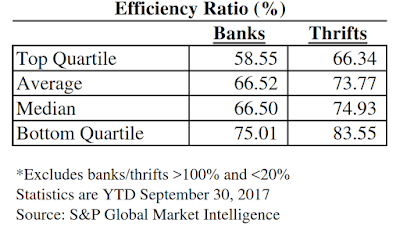 Sub S bankers can gross up those numbers to come up with their equivalents. 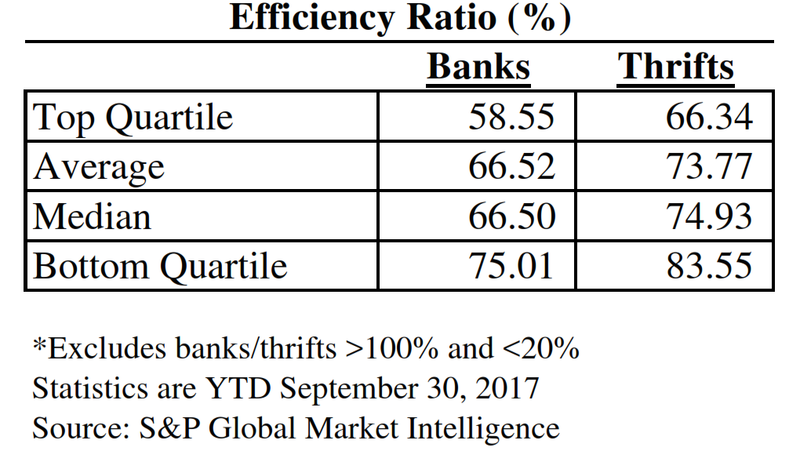 See where your financial institution ranks! Jeff -- Thanks for sharing. A few suggestions. 1. Also look at NIM after net charge-offs to evaluate the "net" NIM. 2. Also look at NIE less Non-Int Inc as percent of assets to factor banks with business models less reliant upon assets. 3. ROA and ROE are "comfortable" numbers but have too much noise in them. I suggest an alternative. 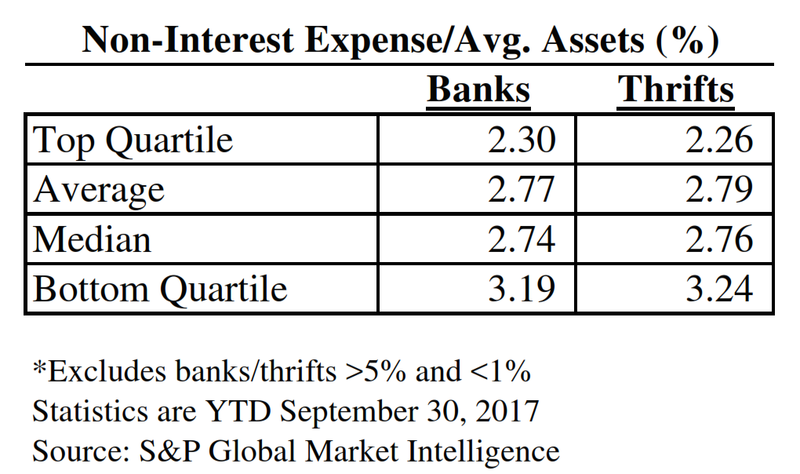 Net interest income (FTE) plus non-interest income less non-interest expense less net charge-offs. It excludes provision, non-recurring items and taxes. 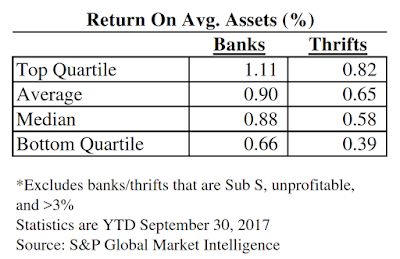 It's a more pure look at bank operations. Still robust, but without the noise. I like the NIM after chargeoff number. And the Net Operating Revenue/AA is a long-used ratio that I didn't include solely for the sake of not using a laundry list of ratios. Not sure I agree with the comfortable numbers. I see plenty of banks have serial non-recurring items. 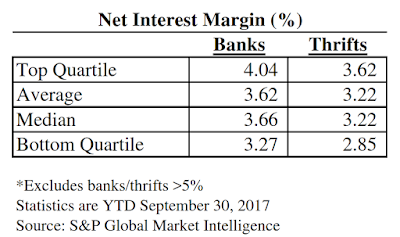 And excluding provision is convenient for banks that assume greater credit risk or are experiencing loan problems.